Enter_ is the debut EP from Romanian electronic trio Temple Invisible. Across its five tracks it demonstrates a group that's not afraid to experiment with its sound, but also with enough pop sensibilities to draw the listener in and keep their attention. Everything From Above starts with a repetitive electronic loop over which Irina starts to sing. It's strangely haunting over the first two minutes of the song, before the loop fades away down to a disturbing almost silence then kicks back in again before bursting into a more all-embracing sound. Irina's voice seems impervious to what's going around it, half-spoken, half-sung. The last minute of the song is instrumental save for some technical wizardry being applied to Irina's backing vocal. Disappearance follows a similar modus operandi. Irina's vocals operate as if in a different room to the song yet it works. Dreamy, airy yet purposeful words over a rumbling, slightly threatening electronica that wraps itself around the listener's ears and seeps into their brain. Collide, the recent focus track from the EP, follows with Irina's vocals pumped up in the mix as the backing in the verses is more understated than elsewhere on the record, although the chorus sees her vocals wrapped around a pulsating clapping beat. It veers off into an instrumental section before Irina half sings half whispers as the beat picks back up until it stops dead in its tracks. Sudden Acts follows a similar vein, Irina's voice duelling with the beats, drifting above them in parts, sunk down in the mix in others to give a haunting, eerie feel to it amongst the studio trickery that's going on in the song. The final track Dimension Dive is the real standout track here though. Irina sounds like she's channeling her inner Kate Bush, such is the drama seeping out of her vocals throughout the track. The instrumental backing is much simpler than on the rest of the EP, but wholly appropriate to the mood that Temple Invisible are trying to create. 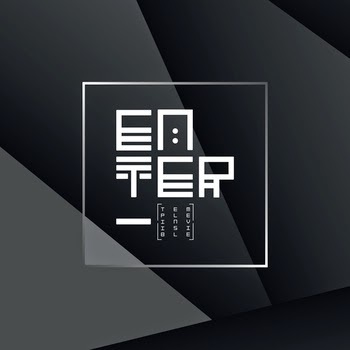 Enter_ is an impressive debut EP, not perfect but the sound of a band that's still experimenting with its sound, playing with the possibilities of what they can create with the gadgetry at their disposal. Irina's vocals are reminiscent of Bjork, able to capture a number of moods and soundscapes almost effortlessly. The Enter_ EP is due out now and can be purchased from Temple Invisible's bandcamp site. Their website can be found here. They are also on Facebook and Twitter.